The upper elementary math curriculum comprises many concepts. Each begins with concrete material that supports its topic, leading to the desired mastery and ability to solve abstractly. The curriculum begins with a simple concept and slowly builds on the mastered foundation. Having a firm mastery of one’s basic math facts is critical for the children. Most initial lessons and presentations—along with math facts based computer program—aid in their retention of these. The child will receive many lessons using golden beads, stamp games, bead frames, or numeration charts to learn place value. 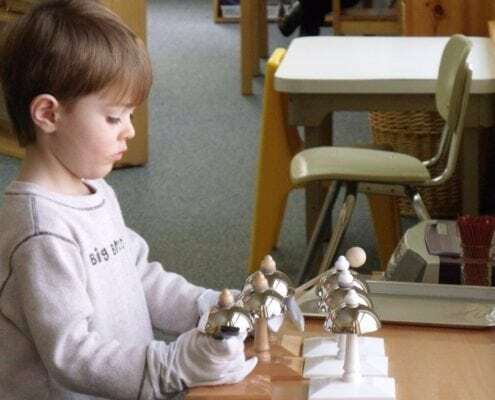 To perform all operations, it is imperative the child knows how to properly set up a problem, which will allow her/him success in determining the answer. Another major area of focus throughout the elementary experience is fractions. The child is first introduced to manageable pieces and images of fractions. This is the foundation the students will continue to build on through all the basic operations: addition, subtraction, multiplication and division. They will work fraction equations involving whole numbers, improper fractions and subtracting fractions with borrowing as a requirement. Fractions are then reintroduced using the Candelabra as decimals. They will work with the Montessori decimal board, Candelabra, and decimal pieces to show place value and quantities. They will learn to recognize greater than and less than quantities, as well as the value of fractions to decimals. Further on in their experience, they will learn to add, subtract, multiply and divide with decimals. Many of the higher level math concepts are introduced using materials with which the child is familiar. For example, in the lower elementary curriculum, a child may have had a snake game presentation for addition or subtraction. When the child is in upper elementary and needs an initial presentation on positive and negative integers, the snake game is also presented. The children are eager to use this material since it has been a while since they have worked with it, and it brings back positive feelings. During the presentation, the child will come to learn there are additional pieces and rules for working the snake game with integers; thus it becomes a teaching tool for them once again. With practice, mastery will come. Our program is specifically designed to track your child’s strengths and weaknesses in math. Their assignments are tailor-made to give lessons and support in any math related area, be it the most simple concept of place value or learning trinomial equations. The upper elementary language curriculum involves learning the parts of the English language and then being able to produce them into the whole. The curriculum is broken into grammar, reading comprehension, writing skills, diagramming, vocabulary and word study. In grammar, we look at the function and usage of words. The children are reintroduced to the parts of speech they learned in lower elementary: noun, adjective, pronoun, adverb, preposition, conjunction, article, interjection and verb. They begin lessons involving finer rules and situations. There are layouts, booklets, and handouts regarding follow-up activities and practice. Reading comprehension is a skill used throughout every aspect of the classroom. There are specific lessons and assignments given to teach and improve this skill, but reading through Accelerated Reader, reading circles, and research through cultural studies are the real practice arenas. For example, when researching Argentina’s culture for geography, a child must read, comprehend, and produce a final product. Writing can be a difficult area for a student. With our curriculum, we progress from the simple to the more complex areas of the writing process. To begin, the child will be introduced to subject/predicate. He or she will learn to recognize them in a sentence, as well as how to properly write his or her own “good” sentences. Sentence diagramming is included in this concept. Learning to diagram sentences early on gives students an additional tool in recognizing proper sentence structure. As their skill becomes more proficient, the sentences become more complex. In addition, the children are exposed to simple note taking skills, editing skills, outlining and webbing. These tools will aid the children with organization and writing throughout their lives. Vocabulary and word study are intrinsic parts of our curriculum. The children are exposed to new vocabulary weekly through both class work and homework, and they have lessons and layouts pertaining to multiple word studies. Word study is broken into many concepts including synonyms, plurals, antonyms, correct expression, homophones, prefixes and suffixes. There are many lessons, layouts, shelf works and writing activities that occur daily pertaining to these topics. All these areas are woven together throughout your child’s two-year experience in the upper elementary, creating thorough exposure and understanding of the English language. At this level, cultural studies are on a two-year cycle to ensure the growth of ideas and concepts. The ideas are presented in a simple form and progress into more complex concepts as the curriculum evolves and builds upon the simple foundations. Science is broken into zoology, human body studies, physical, chemical and earth sciences. Lessons are given in either a large group or small group, depending on the topic. There are always assignments and experiments given to the students as follow up work. Zoology. This study begins in the fourth year with the study of vertebrate animals. We study them in order of evolutionary patterns: fish, amphibians, reptiles, birds and mammals. Fifth year students study the progression of invertebrate animals: sponges, worms, mollusks, arthropods and echinoderm. This age group likes to know how things work, which is why we emphasize learning not only the external parts of animals but the internal parts as well. The best hands-on tool for allowing children to experience both internal and external structures is dissection. All introductory lessons begin with an opportunity to examine and dissect a specimen related to the concept being taught. Each year there is a focus on physical, chemical or earth science. There are always whole group experiments for the students to do independently. Physical Science covers the topics of energy, simple machines, electricity, light, sound and forces. Chemical Science covers the topics of the atom, physical and chemical changes, acids and bases, mixtures, compounds and solution. Earth Science covers the topics of the layers of the earth, volcanoes, space, earthquakes, rocks and weather. History. This area involves much research with many hands-on lessons and activities. The students learn about different events and people throughout history by researching their lives and living conditions, and then live it themselves! The students authenticate their research by creating shelters, clothing and foods in class. The history curriculum begins with a review of the Time Line of Life. This tells about the evolution of one-celled organisms into the plants and creatures living today. The students create their own historic timelines as a follow-up assignment. Archeology relates dinosaurs, fossils and evidence of human existence. The students experience a “mini-dig” themselves, using methods archeologists utilize. We then read and discuss many cultural stories and tell about the creation and evolution of humans. After discussing the stories, crafting masks and acting in a small skit, the students research the many stages of human evolution. They learn about Australopithecus, Homo habilis, Homo erectus, Neanderthal, Cro-Magnon and Homo sapiens. The projects completed by the students in conjunction with these studies are displayed for all to enjoy. Ancient Civilizations are the next study in history. We begin with Ancient Egypt. The students create pyramids, learn how to mummify a chicken, create scarabs, dye clothing with natural resources and create clothing. During all of these projects, the children are doing research and have weekly assignments correlating with these topics. Ancient Rome and Greece are also part of this curriculum before we begin looking at the Middle Ages and Renaissance. We typically incorporate a fashion show of our outfits through history and a feast for the class at the culmination of our studies. Ohio history is important for our students to learn as well. They are introduced to Ohio beginning with its prehistory timeline. Each week the children read about Ohio and learn about its journey into statehood. They study important figures and places in Ohio. Once again, each phase introduced to the students is combined with factual information, follow-up assignments and hands-on projects. We also touch on government, with a study of important national documents, the creation of our government, development of political parties, presidents, amendments and the electoral process. The students enjoy sharing their political views and ideas while learning how to be open-minded about others’ views as well. We learn important skills while “debating” certain topics and are eager to learn how certain mindsets came into existence. Geography. This is another area of strong interest and attention. We begin with basic map skills. This includes recognition of hemispheres, use of the compass rose and finding points using degrees of longitude and latitude. We then progress into country recognition and location. Building a working river and locating all the rivers, deserts and landforms throughout the world is always a long, exciting work. We talk about time zones, populations, flags and cultures. The culmination activities involve researching many countries and learning all we can about them, creating food and projects relating to each country studied. Economic geography is also studied during alternate years. We study money, goods and services, supply and demand, consumer simulation, credit cards, taxes with W-2 forms and real-life simulations. The children always have a great time learning what we consider “real life” experiences. They also create their own “imaginary island” using the experiences and tools they just learned and practiced. For more information about each of these classes, please click here.